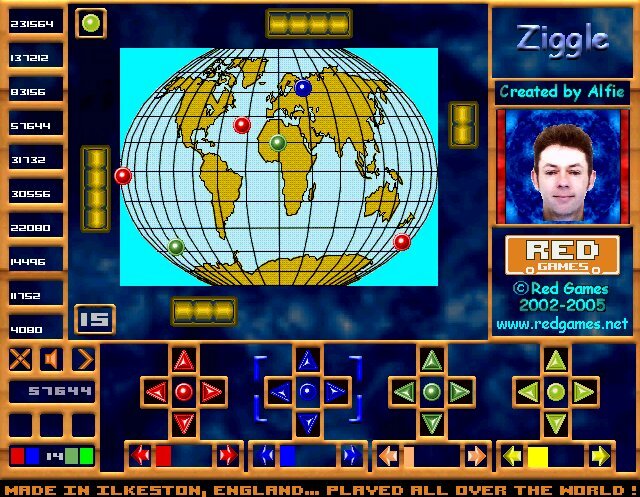 Red Games - Ziggle The Free Arcade Strategy Puzzle Game - Free Fun PC game download ! Keep as many of the randomly spawning Blobs on the world map for as long as you can and at the fastest speed ! Get more points, extra lives or more time by picking up the Star Bonus with a Blob. The timing of a pick up can make all the difference and choosing whether to go for a particular Star Bonus pick up may turn out to be critical ! Use the outer Golden bumpers to help you keep the Blobs on the map. Watch the Blobs when they hit a Bumper because you never know in what direction they may bounce ! The Mouse, Keyboard and Joypad controls are all enabled within every game, so you can play with one specific device or any combination of devices. Switch control over to your PC Dance Mat and Ziggle away with your feet ! 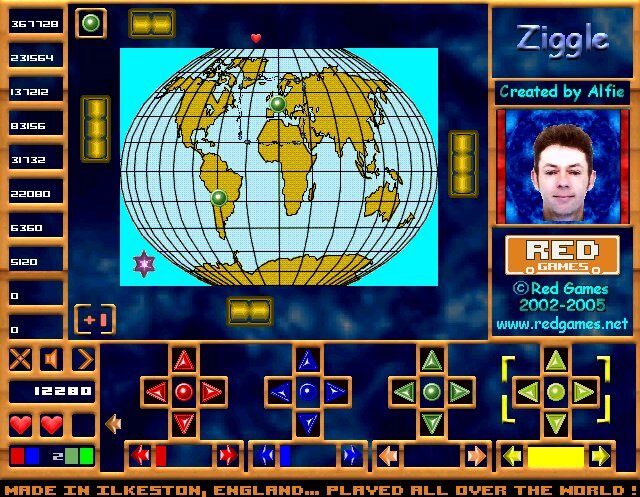 Even though Ziggle has been available for a long time it still surprises me where it is being played, including such small places as Christmas Island. 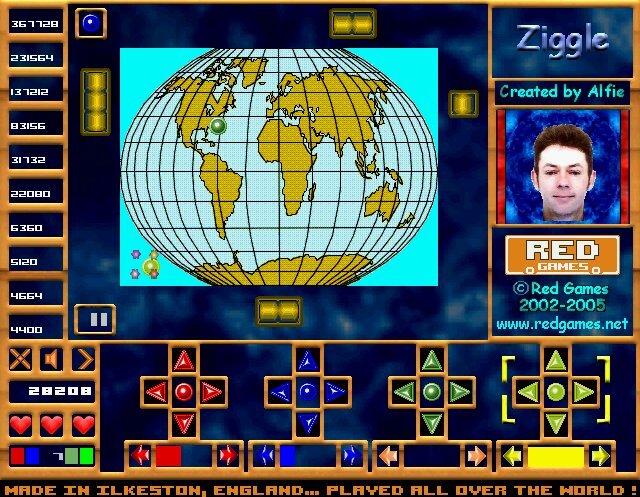 Ziggle has been designed to be playable on most PC's and Laptop's, which means that if your computers operating system is Windows 95 or above then you should be able to play and enjoy the game. Ziggle has been tested and is playable with the Logic3 PC Dance Mat, so you can get even more fun out of the game ! 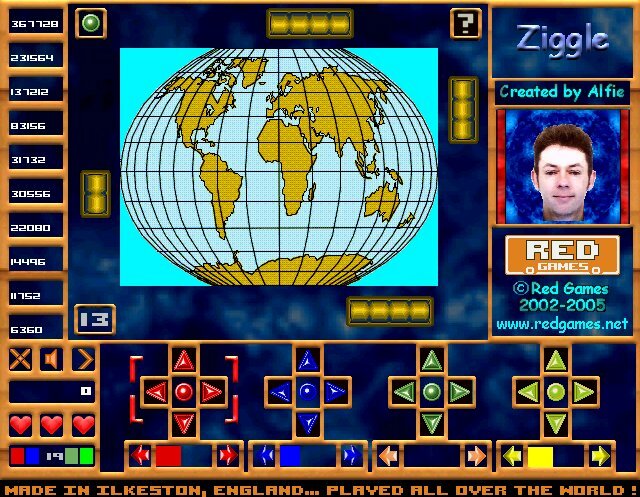 Red Games, Randot, Alfies Game, Letto, Shoop, Wibble, Jam, Gemco, Jiglit and Ziggle are Trademarks of Red Games. All other Trademarks acknowledged.